Sounds like something out of the far distant past, doesn’t it? But it is, instead, an historical library with a forward-thinking view of access to information that makes it — pure and simple — a treasure. Which, of course, makes it just about perfect for American genealogists. The library is open to all researchers, free of charge. Except, of course, that most of us don’t live in Worcester, Massachusetts. A fact the American Antiquarian Society knows perfectly well. And a major reason (along with the fragile nature of many of its holdings) for its digitization efforts: huge numbers of its holdings are readily available in digital format online. From digital prints of images of men in the United States in the first half of the 19th century (Men in the Young Republic) to digital photographs of the Ridgway dinner service called the “Beauties of America”, the online collections of AAS are stunning. It isn’t overstatement to refer to the AAS library as a treasure. The Society makes available, without charge, all of our existing medium resolution (up to 72 dpi) digital images that are in the public domain to be used for any purpose under the terms of a Creative Commons License. No permission is required. If the item you want to use isn’t already digitized, the AAS will try to make a digital copy for you for a very reasonable fee — as little as $15 for a non-commercial user from existing photography or $25 if a new image is needed. 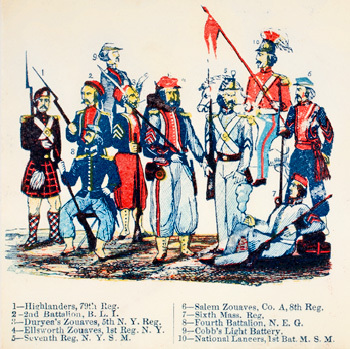 Image A pictorial key of uniformed Civil War regiments, courtesy American Antiquarian Society (cropped). I am not quite as impressed by AAS’s terms for two reasons. First, it can’t make most of the material available under a CC BY-SA license because there is no copyright in slavish reproductions of public domain works. By saying that it is using a CC license, it implies that it a) owns copyright in the reproductions and b) has the right as the copyright owner to license these images under specific terms. Unfortunately there is no standardized way to license rights based on an access agreement to physical content, so I can understand why AAS trys to fall back on the CC licenses. But in doing so, it reinforces confusion over one’s rights as a copyright owner versus one’s rights as the owner of physical content. More importantly, most of the content that genealogists would want to use from AAS’s holdings, i.e. the digitized versions of nineteenth century newspapers and periodicals, is accessible only via commercial partners. Those partners impose, with the consent of AAS, restrictive terms that prohibit the reuse of the content even if it is in the public domain.